If the painted pumpkins didn’t give it away, this year’s Halloween costuming was Teenage Mutant Ninja Turtles themed. Adam and I went as a Channel 6 Cameraman and star reporter April O’Neal, while the Crafty Baby went as ninja turtle Michaelangelo. Adam and I managed to put together our costumes from things we already had around the house, or found at the local thrift store. 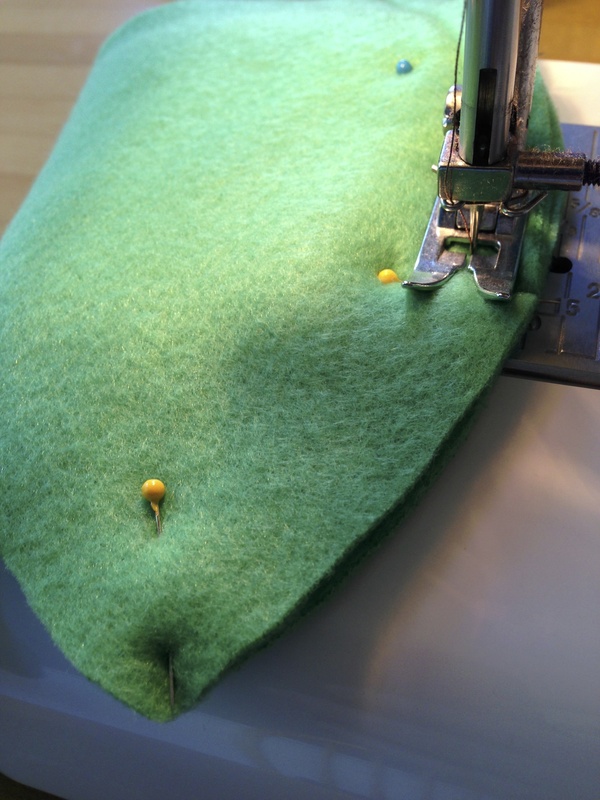 For the Crafty Baby, I converted a plain turtle costume into something ninja-tastic, and topped it off with a quick and easy fleece hat sewn from this free pattern from the website Fleece Fun. 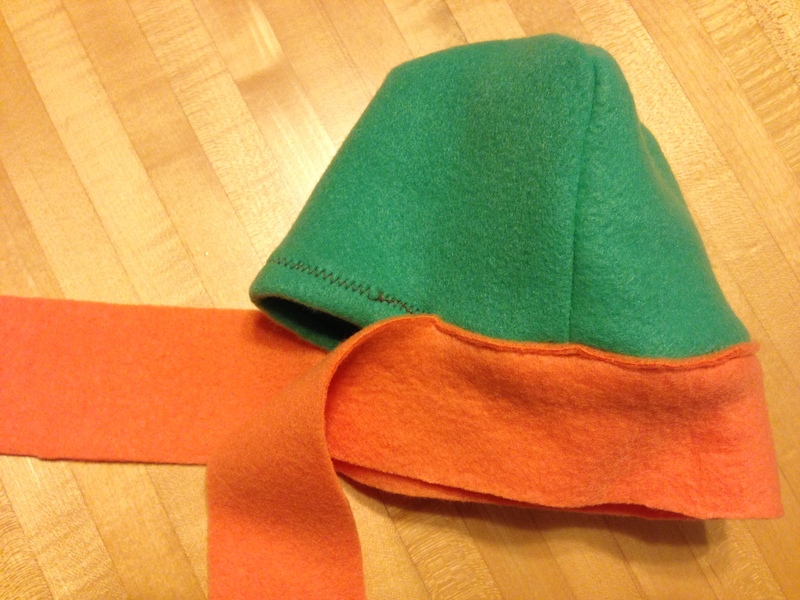 Once the hat was complete I added a strip of orange fleece around the brim, cut out a couple of eye holes, and voila! Ninja mask. 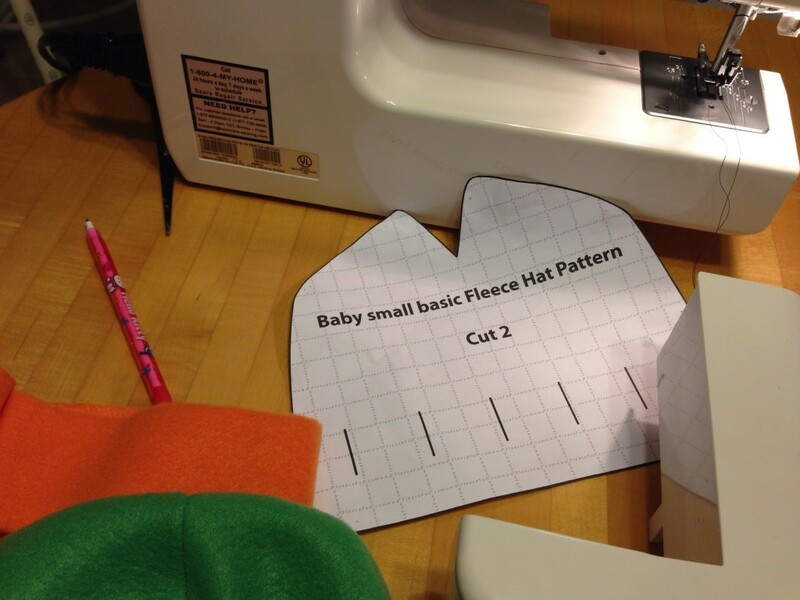 Thankfully, the Crafty Baby is a good sport when it comes to wearing hats and things. 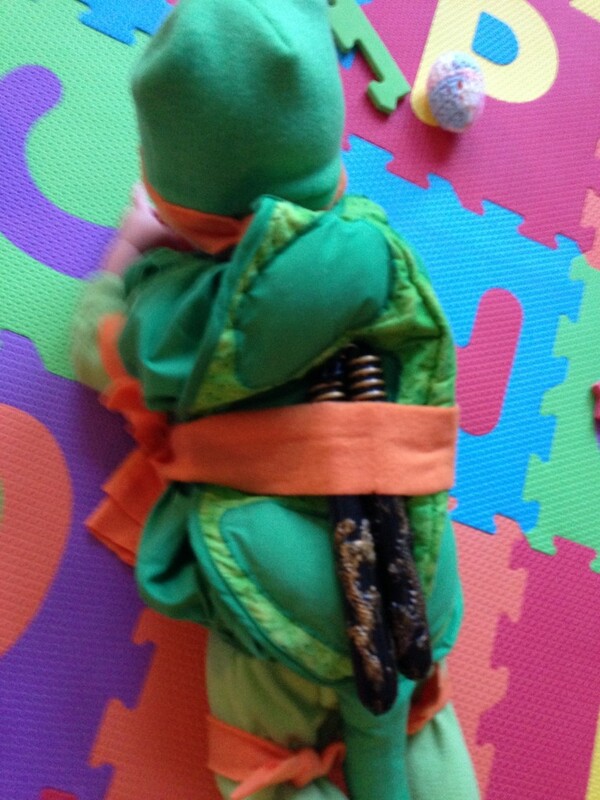 A few more strips of orange fleece tied around the arms and legs of her green “under pajamas”, one around her shell for a belt, and a pair of nunchucks finished out her outfit. For a baby’s-first Halloween costume, I was very pleased with the outcome! We took the evening one creative step further, tossed the evening’s video into iMovie, and put together a fun little trailer. I will definitely be doing more of these in the future. It’s a great way to consolidate a bunch of videos on the same topic into something concise and easily sharable using built-in templates. If you have iMovie, I recommend you giving it a shot! One Response to "TMNT Halloween"